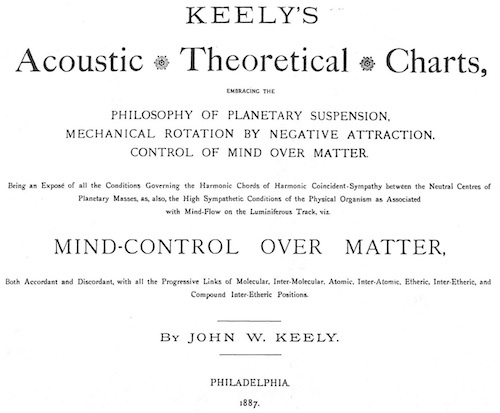 A significant part of Keely's legacy are his beautiful Charts of Vibratory Etheric Science (Sympathetic Vibratory Physics). These are being made available in Black and White and a new colored version keyed to colors of music notes. The Black and White charts are cleaned up hi-res and these were then colored. These images display beautifully on your desktop, wall paper, screen saver and to frame for your wall. Here is the history of these charts as far as my work with them. The coloring (according to music note or sound colors) was done by Caroline Doyle-McManus. NOTE: View these charts as hollow spheres with the chart projected on the inside of the sphere and you are at the center of the sphere looking outward. This Chart of Symbols and Conditions of Vibratory Streams is the key to reading the other charts. It defines the chords Keely used and some relationships.